A few weeks ago I was talking to the lovely EK and somehow we got to talking about reading and the mail and whatnot and we ended the conversation by deciding to start sending packages of books or other fun things to each other. I started by sending her an ARC of Matched by Ally Condie. 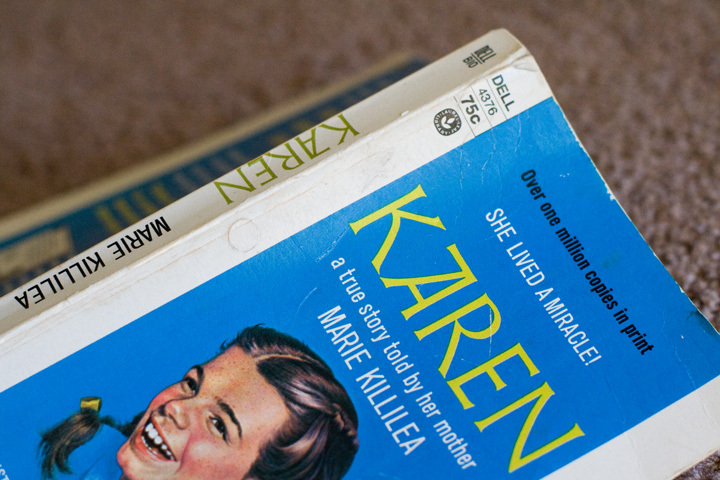 She reciprocated by sending me an old, slightly battered copy of Karen by Marie Killilea. And I'm already planning my next three packages to her and have decided this was pretty much the best idea ever. Getting a (mostly) unexpected package from a friend is enough to completely make your day. Karen is an incredibly charming book. It's the true story of a little girl growing up with cerebral palsy in the 1940s when no one really knew what it was or what to do about it. When it became apparent that something was wrong with their baby girl, Marie and Jimmy Killilea were told to put her in an institution and forget about her as people with cerebral palsy "have no mentality." The story of Karen's growth and development and her family's fierce loyalty and fight on behalf of those with cerebral palsy is so sweet. But what has really struck be about this book is how different the field of medicine has become over the past 60 years. After giving birth, Marie stays in the hospital for at least a week and spends most of that time away from her baby. Karen's doctor suspected she had cerebral palsy, possibly for a long period of time, but didn't tell her parents about it until they begged him to tell them why their almost year old daughter was still laying there like an infant. There have been so many little things that just boggle my mind and make me grateful to live when I do (and that I'm healthy and so are my children). A lovely read, perfect for lounging on the couch and enjoying the cool, rainy days we had this week! The birthing/hospital scenes were the stuff of nightmares for me. The part that really stuck me was that the nurses wheeled her back to her room after giving birth and started fixing her hair and make up for her husband. My goodness. This is why we needed feminism. God forbid having your face on after giving birth to a tiny baby who might not live is the last thing on your mind. It made me sad when she said great grandma was missing something by not bringing the baby home from the hospital when it was her generation who missed out the most by not being able to bond with their baby for the first week of life, not being able to hold their newborn and to breastfeed if they wanted to. I couldn't imagine it. Sometimes I do wonder when bonding really occurred in those days. Whether that really happened when the child was already home and several weeks old. Marie claims to have adored Karen right away, when she only glimpsed her face and never held her. Isn't it strange how, back then they would have found it so cruel so send a child away to daycare for most of the day at six weeks but accepted not being able to hold their newborn and easily relinquished the baby to be cared for by strangers for the first week of their life so they can "rest"? It's fascinating in a way, how it's all social conditioning.